When I worked at an English school for kids about 15 years ago, it was hard to find Halloween-related goods. People didn’t show much interest in the event. Now, the story is so different. 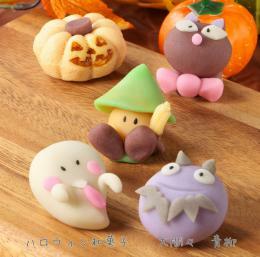 According to a report, the economic effect of Halloween reached 110 billion yen last year. This is much more than other Japanese traditional events and more than Valentine's day, which is also loved by Japanese people. What's going on here! When the season comes, the city is covered with orange color. People wearing costume get together and have a party, and spend a lot of money. 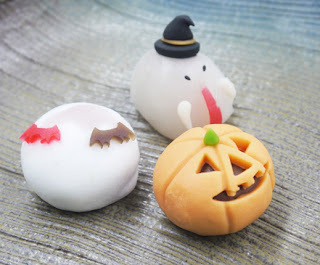 And this year more wagashi, traditional Japanese sweets, seems to joins the event. Can you see the sweets?